This page is a gateway to resources about Marxism compiled by Connexions. You’ll find some articles and books, as well as a handful of quotes, which provide an introduction to various aspects of Marxism. The Connexions website has many more articles and books on Marxism and related topics in addition to the ones shown below. You can find them using the Subject and Author indexes, or the Search engine. For in-depth research, you might also want to check out the Marxists Internet Archive, the largest multi-language collection of Marxist documents online. To find books and articles on the Connexions website written by Karl Marx or Friedrich Engels, the Author index is a good place to start. Go to the M page for Marx and the E page for Engels. Hal Draper traces the historical evolution of the socialist idea. He identifies two sharply different conceptions of socialism: one which seeks to impose a just society from above; the other which holds that socialism can only result from struggles 'from below', that is, by people working together to liberate themselves. Marx’s greatest contribution, says Draper, was to unite the idea of democracy with the idea of socialism, insisting that there could be no democracy without socialism, and no socialism without democracy. In this chapter from A Marxist History of the World, Neil Faulkner presents a brief exposition of the historical roots of Marxism, and its significance. In these two essays, Karl Korsch outlines his view of the key features of Marxism and what he considers are the most effective points of Marxist theory and practice: those specific attitudes, propositions, and tendencies which can be usefully adopted as the guide to our thoughts and action as we try to change the world. A short reflection on Karl Marx and the essentials of his life, by Ulli Diemer. An introduction to Marxist theory by Paul Mattick, from the journal Root and Branch. Many who have not read Marx have heard that he is ‘unreadable,’ but in this article Humphery McQueen celebrates the colour and humour of Marx’s writing, the use of metaphor, paradox, pun, irony, classical allusion and all the devices of the writer’s art. In this book of essays, Marshall Berman explores and rejoices in the emancipatory potential of Marxism. For Bertell Ollman, Marx’s method was his message: “By allowing Marx to focus on the interconnections that constitute the key patterns in capitalism, the dialectic brings the capitalist system itself, as a pattern of patterns, into ‘sight’ and makes it something real that requires its own explanation”. Terry Eagleton tackles common objections to Marxism and demonstrates how and why they are wrong. This essay by Karl Marx presents an overview of his critique of political economy. The preface to this essay is perhaps Marx’s most succinct summary of his approach to political economy. Ellen Meiksins Wood argues that this historical moment, the one we’re living in now, is the best not the worst, the most not the least appropriate moment to bring back Marx. She says that this is the moment when Marx should and can come fully into his own for the first time – not excluding the historical moment when he actually lived. Rosa Luxemburg’s framework, writes Loren Goldner, enabled her to see how capitalism could ultimately destroy society ... a prophecy we see materializing before our eyes today. This article investigate Marx’s natural-scientific notebooks. Marx’s notebooks allow us to see clearly his interests and preoccupations before and after the publication of the first volume of Capital in 1867, and the directions he might have taken through his intensive research into disciplines such as biology, chemistry, geology, and mineralogy, much of which he was not able fully to integrate into Capital before his death. Karl Marx and Friedrich Engels held that capitalism inevitably tears apart the natural conditions that sustain life. They argued capitalism’s exploitation of working people, and the unsustainable exploitation of nature, were linked and part of the same process. Socialist thought, says John Bellamy Foster, is re-emerging at the forefront of the movement for global ecological and social change. Marx insists that production as a social and material process is shaped and constrained by natural conditions. Paul Burkett shows that it is Marx’s overriding concern with human emancipation that impels him to approach nature from the standpoint of materialist history, sociology, and critical political economy. For a discussion of Burkett’s book, see Martin Empson’s review. Explores humanity’s contradictory relationship with the environment: our role in destroying nature, and our potential to for positive change. For a discussion of the book, see this review. Karl Marx was only able to complete Volume 1 of Capital before he died. Volumes 2 and 3 were completed by Friedrich Engels using Marx’s unfinished drafts and notes. Capital is a difficult book, made more daunting by the fact that the first chapter is particularly theoretical and technical. For someone considering reading Capital, it is worth bearing in mind that there is no law that says you have to read the whole thing from beginning to end. Marx himself suggested, in a letter, that rather than start at the beginning of Capital, a reader could start off with Chapter 10, on the Working Day, and then move on to Chapter 13, on Co-operation, and then to Chapter 14, Division of Labour and Manufacture, and then on to Chapter 26, Primitive Accumulation. Karl Korsch, in his Introduction to Capital, suggests the reader start with Chapter 7, then skim chapters 8 and 9, and then read Chapter 10. There are also many articles, essays, and books commenting on and explaining Capital. A few of them are listed below:. Lots of people who start Karl Marx’s Capital get stuck somewhere in the early chapters of Volume 1. Here are some suggestions about how to get unstuck and read the whole book. David Harvey wrote this book with the aim of guiding the first time reader through the text and making Capital relevant to the understanding of contemporary capitalism. Harry Cleaver offers a practical, political interpretation of Marx’s Capital. Marx’s socialism (communism) as a political programme may be most quickly defined as the complete democratization of society, not merely of political forms, says Hal Draper. For Marx, the fight for democracy was a leading edge of the socialist effort; an integral part of it all. Written in 1848 by Karl Marx and Friedrich Engels as the theoretical and practical platform of the Communist League, a workers’ association. A commentary on the Communist Manifesto and its relevance to the twenty-first century, by Marshall Berman. Karl Marx’s analysis of the revolutionary Paris Commune of 1871. Karl Marx’s incisive criticisms of the programme adopted by congress to unite the two German socialist parties in 1875. In highly compressed form, this is a key formulation of Marx’s views of socialism and the state. Karl Korsch explains the significance of Marx's Critique of the Gotha Program. Of all Karl Marx’s shorter works, says Korsch, this is the most lucid and forceful expression of the bases and consequences of his economic and social theory. Surveys the thinking of Marx and Engels on the “dying-away” of the state in socialist (communist) society. Michael Löwy emphasizes the open quality of the Marxist world view, in contrast with the conventional caricature of a closed, dogmatic system. For responses to Löwy's essay, see On Criticizing Marx by Ernie Haberkern and On Marxism and Method by Martin Glaberman. A review of a book on Marx’s views on women’s oppression. Eve Mitchell looks at the history of identity politics and intersectionality theory in effort to construct a Marxist critique of intersectionality theory, and offer positive Marxist conception of feminism. One objection to Marxism is that it originated two centuries ago in Europe – so what could it have to say to the world’s oppressed today? Lance Selfa has an answer. A review, by Adaner Usmani, of Vivek Chibber’s book Postcolonial Theory and the Specter of Capital. Franklin Rosemont delves into Marx’s Ethnological Notebooks and examines their significance and relevance towards today's communist movement. An examination of some of the most common anarchist misconceptions about Marxism, focusing especially on the authoritarian and conspiratorial ideas and practice of the anarchist writer Mikhail Bakunin. Maximilien Rubel argues that under the name communism, Marx developed a theory of anarchism; and further, in fact it was he who was the first to provide a rational basis for the anarchist utopia and to put forward a project for achieving it. A wide-ranging and thorough exposition of Marx’s views on democracy. 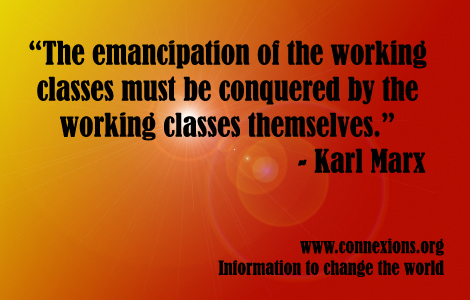 Examines the development of the thought of Marx and Engels on the role of classes in society. Ellen Meiksins Wood provides an explication and defense of the key theoretical concepts relevant to socialism, understood to be the most radical social and economic democracy. Brian S. Roper traces the history of democracy from ancient Athens to the emergence of liberal representative and socialist participatory democracy. He argues that democracy cannot be understood separately from the social and economic contexts in which democratic states operate. Kevin B. Anderson explains that Marx’s critique of capital was far broader than is usually supposed. To be sure, he concentrated on the labour-capital relation within Western Europe and North America. But at the same time, he expended considerable time and energy on the analysis of non-Western societies, as well as race, ethnicity, and nationalism. For a rdiscussion of Marx at the Margins, see this review. A review of Peter Hudis’ book Marx’s Concept of the Alternative to Capitalism (see below). In contrast to the traditional view that Marx’s work is restricted to a critique of capitalism – and that he consciously avoided any detailed conception of its alternative – this work by Peter Hudis shows that Marx was committed to a specific concept of a post-capitalist society which informed the whole of his approach to political economy. Much of Karl Marx’s most important work came out of his critique of other thinkers, including many socialists who differed significantly in their conceptions of socialism. Hal Draper looks at these critiques to illuminate what Marx’s socialism was, as well as what it was not. This page was compiled by Ulli Diemer for Connexions.